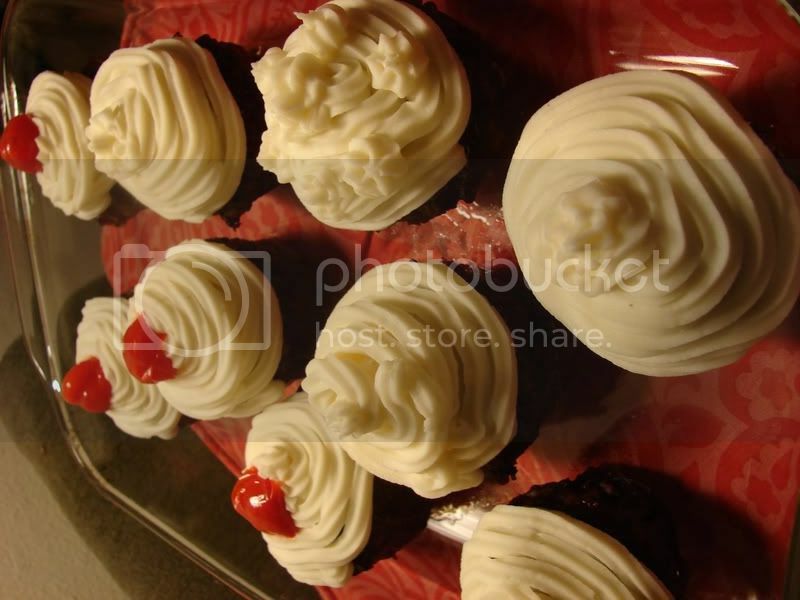 Cupcakes are all the rage, that's for sure. Why not? they're cute, yummy and versatile. 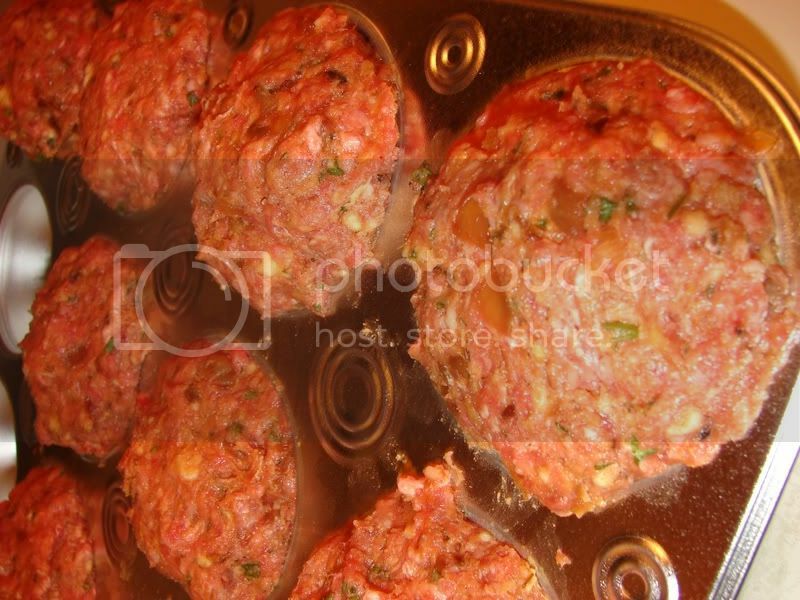 Recently, I came across this gallery of meat cakes. And noticed someone had tried meat cupcakes. And I decided I needed to try to make some meat cupcakes. Basically, small meatloaves with mashed potato frosting. I've never made meatloaf, though, so I wasn't sure how to begin. If you can't find chuck and/or sirloin, substitute any 85 percent lean ground beef. Handle the meat gently; it should be thoroughly combined but not pastelike. To avoid using the broiler, glaze the loaf in a 500-degree oven; increase cooking time for each interval by 2 to 3 minutes. See Illustrations Below: Creating a Free-Form "Loaf Pan"
1. Adjust oven rack to middle position; heat oven to 375 degrees. Spread cheese on plate and place in freezer until ready to use. Prepare baking sheet (see illustration below). 2. Heat butter in 10-inch skillet over medium-high heat until foaming; add onion and celery and cook, stirring occasionally, until beginning to brown, 6 to 8 minutes. Add garlic, thyme, and paprika and cook, stirring, until fragrant, about 1 minute. Reduce heat to low and add tomato juice. Cook, stirring to scrape up browned bits from pan, until thickened, about 1 minute. Transfer mixture to small bowl and set aside to cool. 3. Whisk broth and eggs in large bowl until combined. Sprinkle gelatin over liquid and let stand 5 minutes. Stir in soy sauce, mustard, saltines, parsley, salt, pepper, and onion mixture. Crumble frozen cheese into coarse powder and sprinkle over mixture. Add ground beef; mix gently with hands until thoroughly combined, about 1 minute. Transfer meat to foil rectangle and shape into 10 by 6-inch oval about 2 inches high. 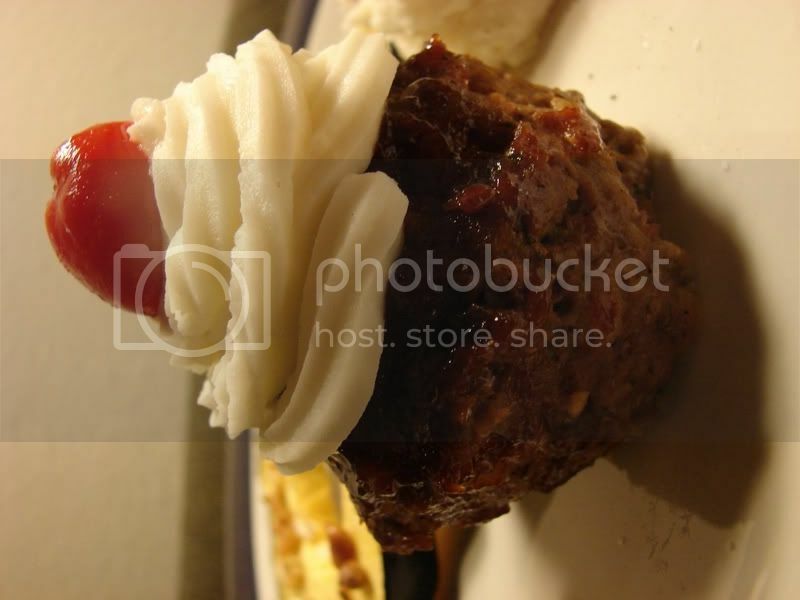 Smooth top and edges of meat loaf with moistened spatula. Bake until an instant-read thermometer inserted into center of loaf reads 135 to 140 degrees, 55 to 65 minutes. Remove meat loaf from oven and turn on broiler. 4. While meat loaf cooks, combine ingredients for glaze in small saucepan; bring to simmer over medium heat and cook, stirring, until thick and syrupy, about 5 minutes. 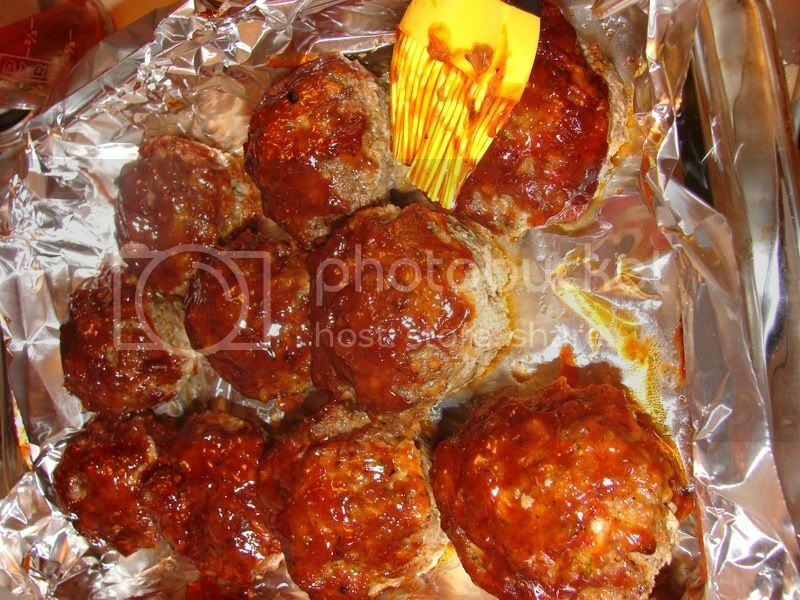 Spread half of glaze evenly over cooked meat loaf with rubber spatula; place under broiler and cook until glaze bubbles and begins to brown at edges, about 5 minutes. 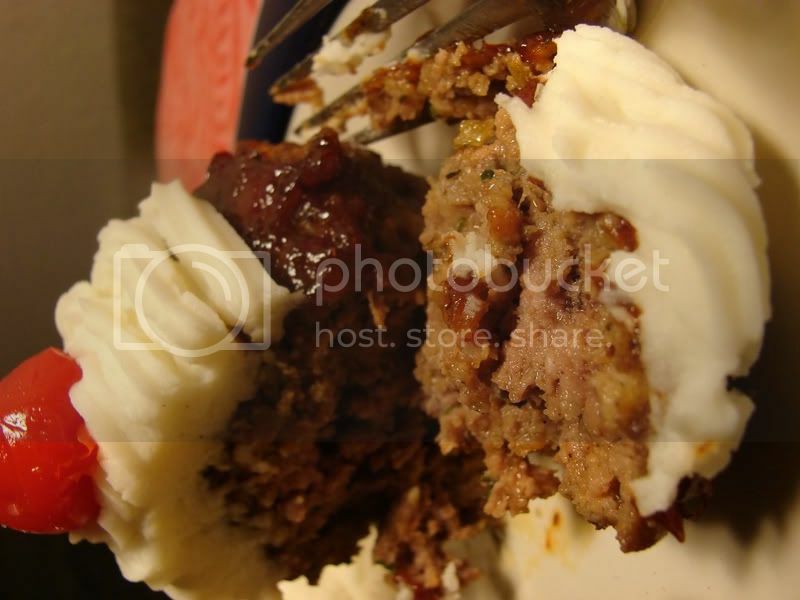 Remove meat loaf from oven and spread evenly with remaining glaze; place back under broiler and cook until glaze is again bubbling and beginning to brown, about 5 minutes more. Let meat loaf cool about 20 minutes before slicing. Here are the little meat cakes before meeting their fate in the oven. Out of the oven! Pretty messy...making little cakes this way causes a lot of grease build up. I transferred them to a clean dish to glaze them. Putting the glaze on. The glaze is wonderfully flavorful. Sweet, spicy, sticky. Yum! Here's the finished Meat Cupcakes! I used instant mashed potatoes (sue me! ), which helped me get a good thick consistency for piping it on the meat cakes. The "cherry" on top is a peppadew, who's sweet peppery flavor went really well with the meatloaf. 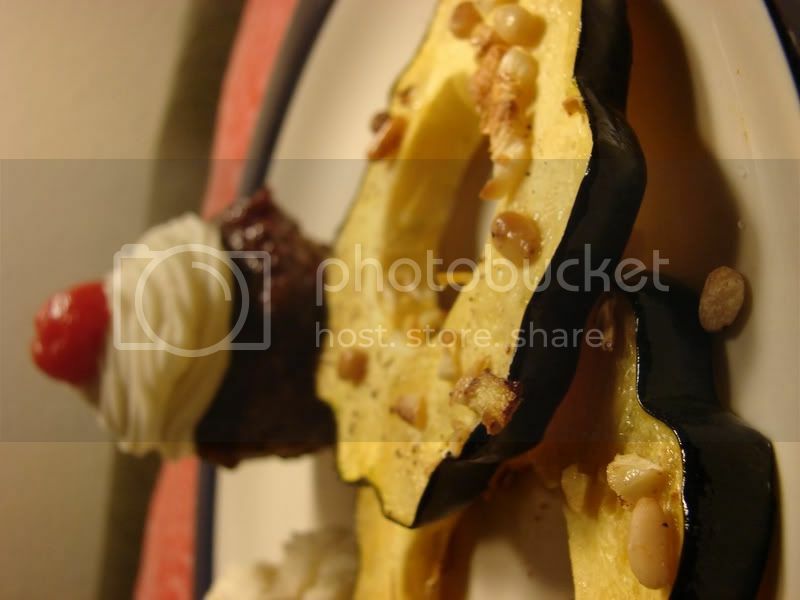 I served the meat cupcake with some baked acorn squash. They were so cute together! Here's the cupcake all cut open. It was moist and delicious! These were a blast to make. A bit messy and kinda time-consuming, but for a chilly Spring weekend night, I highly recommend it. For more inspiration, check out these cute meat cupcakes from Food Network Canada! Candied fennel, huh? Those look yummy! I make meatloaf all the time. "easilydistractd" got me hooked on the easiest meatloaf recipe of all time. But it is good. Paula Deen's basic meatloaf. The topping is what makes it. Sometimes I have to make extra topping. I know it is really basic but it is tasty. Just thought I would share! I like to serve lots of nibbly bits when we have guests, so people can pick and choose what they want. I will definitely try these for the next time! These are incredibly cute and awesome. Hi! SO awesome to see that my gallery inspired you to make something so beautiful! May I add your meatetarian delights to the gallery? sally, thanks for the recipe. I enjoy some Paula Deen. I could hang with her. Love you southern gals. sylvia, I bet these would work in a mini-muffin pan, too, for a smaller "nibbly bit." (I'm so incorporating that term into my every day vocabulary). cass, thanks! They were so much fun! tragerstreit, HECK YES you can put them in the meatcakes gallery!!! I would be honored! Thanks! OMG those look awesome. I think i'll make those for Brian's bday next weekend. Thanks for posting! Wow! 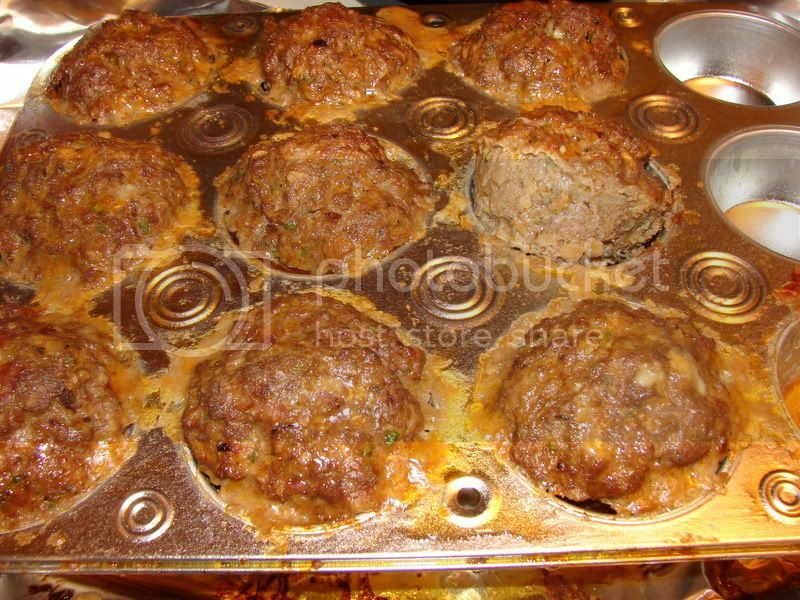 I recently tried my first meatloaf recipe... but these are just so cute! - and easy to store leftovers. These were such a great idea!! My friend had a going away party and the whole evening was a Chicago theme. I called these "Chicago's monsters of the midway beefcakes" One of the best things I have ever made :) Thanks! more asparagus + homemade icecream!! !